This Okie could not have been more surprised to learn that one of the coolest kinds of wildlife around is seaweed! 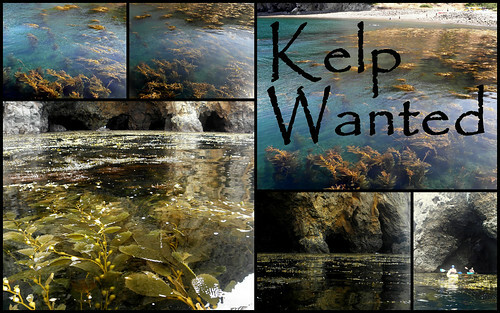 The beauty of the kelp forests around the Channel Islands is clear to any visitor. Did you know this amazing plant grows 12 inches per day in cold water? We even got to snack on some of the young bits of kelp. It ain't bad! Sea kelp is one of the fastest-growing plants on earth, in fact Japan has harvested kelp from its natural habitat commercially for over a century. More pics from our trip can be seen on our Flickr feed. 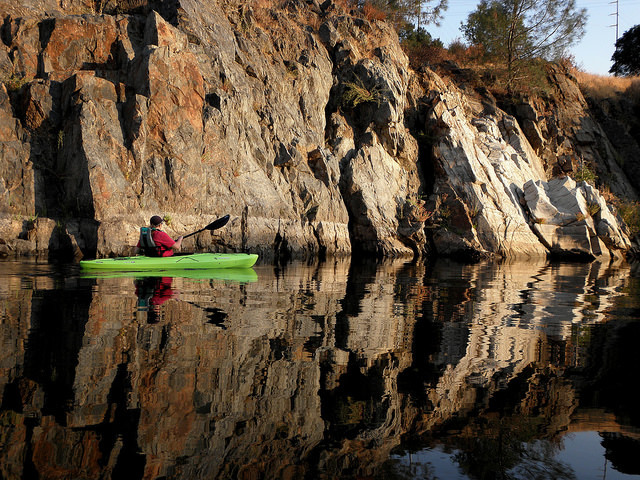 What an amazing paddling trip! Dianne and I drove about 6 hours to Ventura, California. Early the next morning we took a one-hour ferry ride to Santa Cruz Island for some sea kayaking! 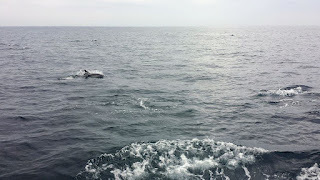 The ferry ride itself would be pretty dull, but we were blessed with some company about halfway out. 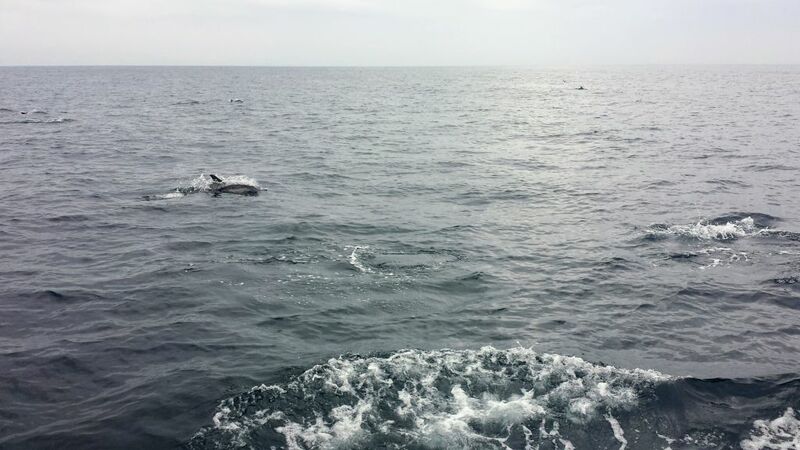 A pod of dolphins swum up to check us out and surf our boat wake! We also saw some seals and sea lions and the ever-present sea gulls. 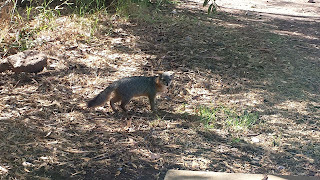 Shortly after our arrival at Scorpion Beach we spotted a few of the Santa Cruz Island Foxes that abound here. They are dwarf foxes. Our guide says that their dwarfism is an evolutionary result from being genetically secluded on the island. It was nice to have a few minutes to relax and watch the foxes while my stomach settled down from that ferry ride! 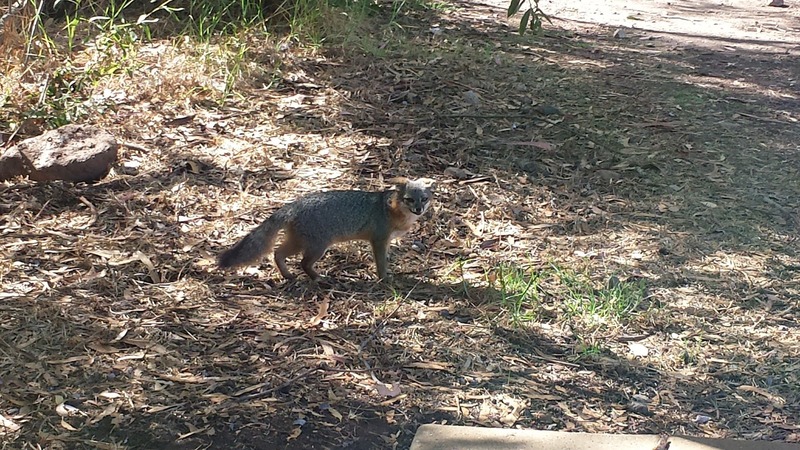 Santa Cruz Island is known for three main things: the island foxes, kelp forests, and some very cool sea caves. We came to kayak through as many of these sea coves as the time and the tides would allow. Our guide led us to an through 6 or 8 of these amazing places on our three hour sea cave kayaking tour. The kayaks were all wide heavy SOT kayaks, well suited for the quickly changing conditions. This ain't flatwater kayaking, The waves were much larger than I have ever paddled in on Eufaula and the weather was great...so you should expect to get wet. I have some more fun pictures to share from the trip, but Dianne and I were in a tandem kayak so you won't see much of either of us. Additionally, the dark steaminess of these sea caves makes kayak photography even harder than usual! However, the experience of paddling through sea caves is a blast and many of them are truly beautiful inside! Other sea caves are dark and loud and steamy and the constantly changing water level can make you woozie! In any case, emerging from the darkness into the bright sunlight was always a bit thrilling! This time I took two cameras and no lights in hindsight that was a poor choice. There was lots to photograph, once the sun came out. 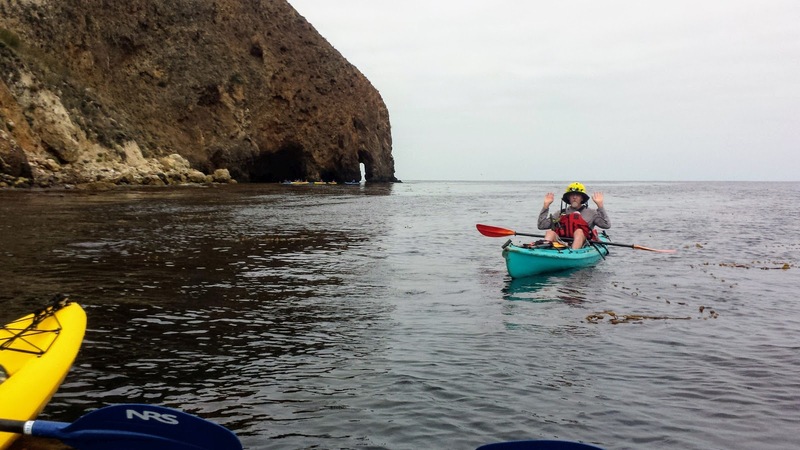 Santa Cruz Island even has their own Elephant Rock, just like on the Illinois River in Oklahoma...sort of. Here is a photo of it. See the elephant? 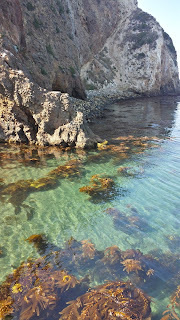 I highly recommend contacting Channel Islands Adventure Company and taking this trip if you ever get the chance. A Wacky Boat Race is a new, fun way to participate in the Grand River Dam Authority Scenic Rivers Fall Fest 2017 on Saturday. The Kiwanis Club, with its annual Race for the Kids, is partnering with GRDA to create a festival atmosphere from 9 a.m. to 3 p.m. at Diamondhead Resort, 12081 Oklahoma 10. Registration for the canoe and kayak races is at 9 a.m. and the race begins shortly afterward. For the Wacky Boat Race, participants can decorate a vessel or make a floating raft. 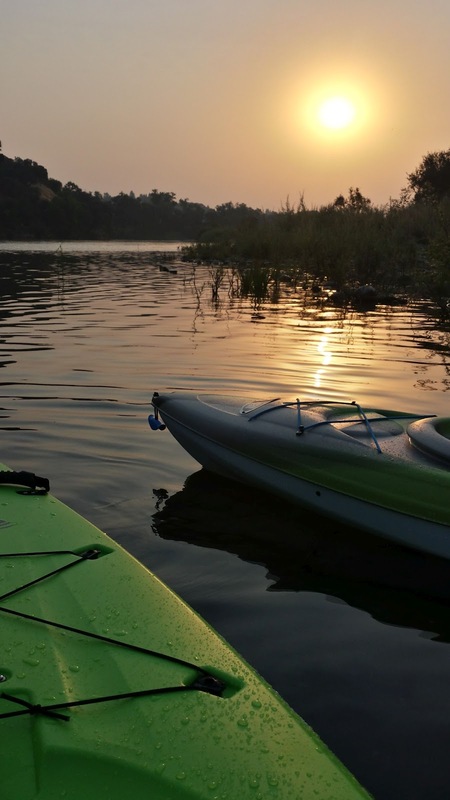 Four kayaks will be prizes for competitions – two for the canoe race, one for the kayak race and one for the Rubber Ducky Race. For entries into the afternoon Rubber Ducky Race, participants can purchase one ticket for $5 or five for $20, with prizes for winners. Proceeds of the Kiwanis' activities all go to support kids programs.